Back in my day, jeans were as skinny and as low rise as they could be. Thank goodness that's over. A couple years ago when high-waisted pants started coming back into style, my friend made fun of me in a Forever21 dressing room because I was stockpiling high-waisted shorts like the style-pocalypse was coming. She equated high-waisted pants to looking like a grandma and couldn't understand why I was so excited. Look who's laughing now! I know high-waisted pants aren't for everyone's taste, but they were made for short girls like me. I am 5'2" with a long torso and short legs. No bueno. We short girls need high-waisted jeans like you need water to live. The high rise gives us the illusion of long, long legs without actually having long, long legs. That's a straight up miracle in my book. Now, pair a high rise with a wider leg on the bottom? Designers are finally back to speaking my language. 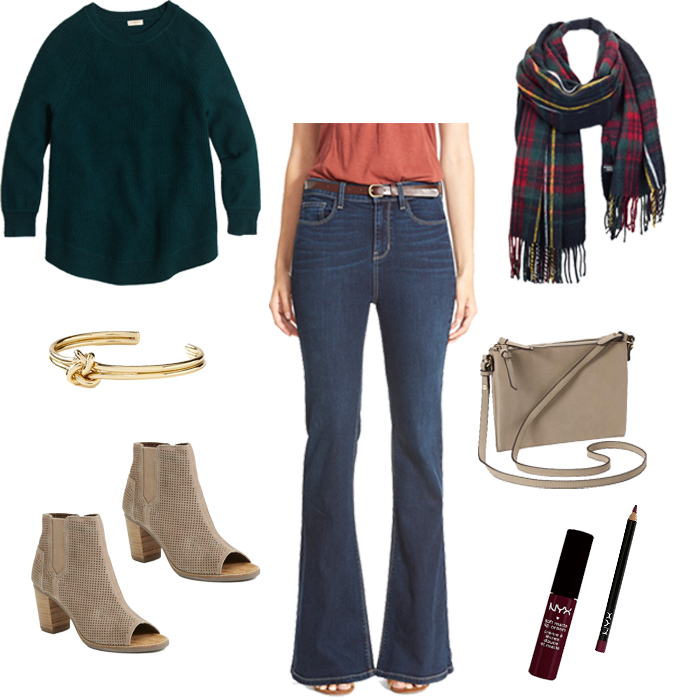 Flare jeans look better on short, curvier girls like myself than skinny jeans because skinny jeans emphasize our curvy, curvy hips. I usually end up looking like a short, squatty pear unless I'm wearing heels and the right top to draw attention from those hips. A wider leg at the bottom really helps brings everyone's eyes away from my hips and down to my toes. (Pedicure is always on point just for these moments.) That's exactly what this short girl needs. The best part is that high rise, flare denim usually look fantastic on everyone. This pair from Nordstrom has been hanging out in my wish list for over a month waiting for me to purchase and they're only $59! That's a steal. I also like another pair from there, this pair from Banana Republic, this other inexpensive option from J.Crew Factory, and am obsessed with this pair from Pine Boutique. What do you think about this trend? Love it or hate it?